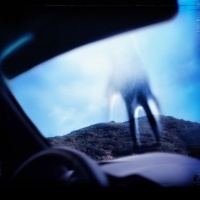 Difference between revisions of "Year Zero"
*All versions feature an etching of The Presence with the words "NINE INCH NAILS / YEAR ZERO" on side D.
Year Zero (also known as Halo 24 or Year Zero: Zero-Gen-Ten in Japan) is the sixth studio album by Nine Inch Nails, released on April 13, 2007 in the UK and Europe, and April 17, 2007 worldwide, by Interscope Records. It was produced by Nine Inch Nails frontman Trent Reznor in collaboration with Alan Moulder and engineer Atticus Ross, both of whom worked in a similar capacity on Nine Inch Nails' previous major studio release, With Teeth. Mastering was done by Brian "Big Bass" Gardner. A subsection of nin.com, yearzero.nin.com, was created and contains various things Year Zero-related. An alternate reality game was constructed by Trent Reznor and Rob Sheridan, then run in partnership and developed by 42 Entertainment to provide listeners with a greater understanding of the album's concept. Reznor paid for the ARG himself, trying to keep it a secret from his record company as much as possible, stating: "What you are now starting to experience IS 'year zero'. It's not some kind of gimmick to get you to buy a record - it IS the art form... and we're just getting started. Hope you enjoy the ride." The game ran from roughly February 12, 2007 to May 2007, beginning when a string of mysterious websites was discovered around the internet related to the album; the game has since been nominated for two Webby Awards. Learn more at the Year Zero Research page and view the timeline of discovery for an explanation of how things unfolded, also, 42 Entertainment has a complete overview of the project here. The white bars in the bottom left of the Meet Your Master lyrics page are different in the Metropolis Records release and Interscope release of the CD. When combined with similar lines found on an Open Source Resistance flier the words "VIABILITY INDEX" can be read, leading to http://www.viabilityindex.com. On April 1, 2007 a bootleg recording of the Chicago, Illinois listening party of March 18, 2007 surfaced on several peer-to-peer networks. The quality of the recording is very low and it is apparent that whoever made the recording did not have very good sound capturing equipment, presumably a cellphone. On April 4, 2007 a high-quality leak of the promotional disc supplied to listening parties was also leaked onto peer-to-peer networks. Perhaps to counteract and discourage any piracy of the leak, the entire album was made available for free streaming on the album's official website later that afternoon. Shortly after the stream was made available, high-quality leaks found their way to various sites and P2P networks. Reznor has stated that multitrack files for all the songs on the album will be released, making them available for fans to remix for free. In March 2007, the multitrack audio files of the first single, "Survivalism," were released in Garageband format on the official Year Zero website for fan remixing. The multitrack files for "Capital G," "My Violent Heart" and "Me, I'm Not" were then released on April 26; those for "The Beginning of the End," "Vessel" and "God Given" were released on June 12. The formats were for Garageband and Logic Pro, and there were also WAV files for other applications, with the latter distributed through BitTorrent. The entire album was released in multitrack form on the Y34RZ3R0R3M1X3D album. Reznor has stated that Year Zero is “part of a bigger picture of a number of things I’m working on. Essentially, I wrote the soundtrack to a movie that doesn’t exist." In March of 2007, Kerrang! Radio reported that "Reznor admitted he’s already in talks about a movie version of his upcoming album, a concept piece, with part two scheduled next year." Reznor has said that he is currently more interested in a television project rather than a film and that he has a producer and has met with writers."